If you have a form containing various images (backgrounds, banners, icons, photos) and those images are displayed okay when the form is viewed at its non-secure (http://) URL but not at the secure (https://secure) one, or your browser gives a warning about the page containing non-secure elements, the images need to be stored at secure locations (URLs). 6. 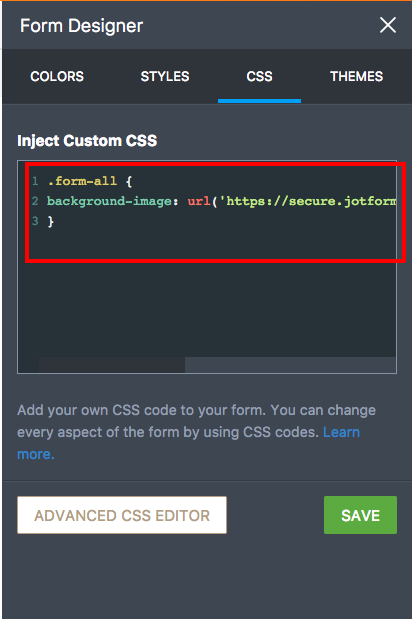 For background images, replace the URL in the injected CSS with the secure (https://secure...) version of the URL that would have been obtained from the submission records of the image upload form. 7. After updating all of the image URLs, save the form. I am not computer savvy and someone sent me a jotgorm claiming to be giving me money from Lottery Winnings . He claims that he will be randomly picking people to give money to in exchange for my email and Telephone number . Sound a scam? Thus far, I use a dummy form to which I have an image element in which I upload the image needed in the true form. This puts the image in the list of "uploaded" images. The URL for all those images, stored in Jotform, seem to work just fine for me. How do I insert an image into a form, i.e., a logo picture, that is filed on my computer. I uploaded image through "this form" URL and...the image is gone and nothing happens. Submission is empty for each of my forms. When the image go then?